The holiday season brings many emotions to the surface, doesn’t it? And if you have lost someone who was dear to you from this earth within the past year, it can easily evoke dark, painful emotions you may have never experienced before. For those who have faced a deep loss, the holidays are a reminder of your missing loved one. Some don’t even want to acknowledge Thanksgiving Day or Christmas, as the pain of who is missing is greater than the joy of who is still here. Only those who have experienced this can understand and agree with what I am saying. To those who are blessed to have not yet faced a tragic deep loss, this doesn’t make any sense, which can cause conflict among families, because each person will have a different way of grieving, based on their own personality and their personal relationship with the family member who is now gone. Most of us try to “enjoy” the season for those around us who weren’t affected as deeply, don’t we? Especially if there are young children or grandchildren around. But it is difficult, because our hearts can be so heavy. Even within the joy of seeing their excitement, there is often an undercurrent of sadness that just won’t seem to go away. I want to let you know that it is okay, even normal, to have this struggle. And I want to release you from feeling guilty about it. Give yourself grace, just like you would a friend if they were in the same situation. You see, grief is not an event. 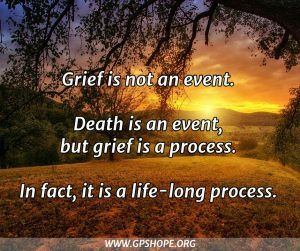 Death is an event, but grief is a process. In fact, it is a life-long process. Some people will parrot the saying, “Time heals all wounds.” I don’t agree. The wounds of having someone very dear to us leave this earth is one that will be with us until it is our turn to leave. BUT that doesn’t mean it will always hurt so deeply. Time will allow the pain to lessen, if we lean into it and allow ourselves to walk through the valley of the shadow of death, holding the hand of the One who can give us the strength we need. My oldest daughter, Becca, loved the holidays. She especially loved Christmas. She loved decorating. She loved shopping (including the Black Friday sales). She loved the Christmas music. She loved the family spending time together. She loved everything about it. When Becca died on October 12, 2011, I don’t even remember that first holiday season. Everything was a painful blur. I didn’t think it was even possible, but the second year was even more painful than the first. About the only thing I remember about that second holiday season was one of my sons giving me a Christmas gift of a beautiful heart ornament that was hand painted in Becca’s memory. The following couple of years my heart still struggled to be part of the holiday season. I went through the motions for the sake of the family, especially my grandchildren. One year, Becca’s collection of Snow Buddies made it to my house, and I agonized over whether I wanted to set out her favorite Christmas display in my home. I cried some pretty hefty tears while pulling them out and setting them up, but once they were all out and displayed, it felt like she wasn’t quite so far away anymore. I didn’t think it would ever happen, but I realized I was actually making the shift from feeling like the holidays were a slap-in-the-face reminder of my daughter being gone, to wanting the reminders because they had become warm memories I longed to embrace. There was something behind all of this, that made it even possible. I had hope that my life would not always be this desolate and painful. 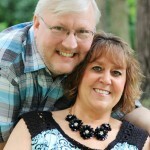 I had hope in God’s resurrection power; that He could and wanted to breathe life back into me, when I felt like I died after the death of my daughter. As the hope I had took root and started to grow, other things began to grow as well. 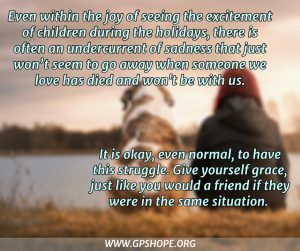 And believe it or not, this time of year is one of the best times for that growth to happen for those of us who are grieving. First, because being grateful opens the door to making a needed shift in our focus. There is no question Thanksgiving is a bittersweet time for anyone who has faced a deep loss. We can’t stop the unexpected grief waves that attack which can make our hearts feel shattered into a million pieces. 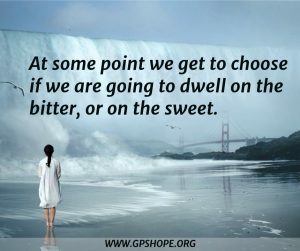 But after we allow ourselves the needed time to lean into the grief, we can make the decision whether we are going to stay there and wallow in it or take steps to pull ourselves out of the grief pit. And when it comes to Christmas, the whole reason Jesus came to this earth as a baby was to become a man and die so that we could have Life. God the Father knows what it is like to have someone very close to Him die, as He watched the torturous murder of His Son. He did that as an exchange for us, so that we would not have to stay in our place of suffocating darkness and pain of grief. Once again, I want to acknowledge that we are going to have many surprise grief attacks that we will need to allow ourselves to lean into fully, whatever that looks like for each of us in that moment. And the fresher the loss, the more of an undercurrent of pain and sadness we will have throughout the season. But we will get to a point (if not this year, then probably within the next year or two) where we can choose whether our main focus is going to be on death, or life. Our loved one died, but they also lived. Jesus died, so He could bring life. 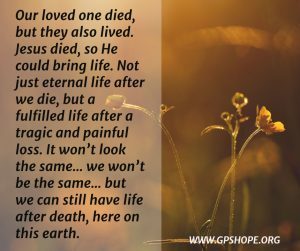 Not just eternal life after we die, but a fulfilled life after a tragic and painful loss. It won’t look the same… we won’t be the same… but we can still have life after death, here on this earth. So, go ahead and grieve your loss that hurts so deeply. It is okay and necessary to feel that. 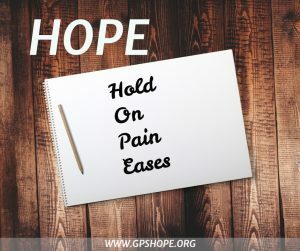 But also have hope within that grief and remember: Hold On Pain Eases. 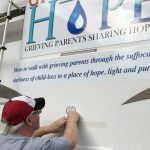 If you would like to give a “gift” to your departed loved one this year, you may want to consider sponsoring an “In Loving Memory” heart decal, to be placed on the Hope Mobile. We would be honored to take him or her with us as we travel around the nation, keeping your loved one’s memory alive. 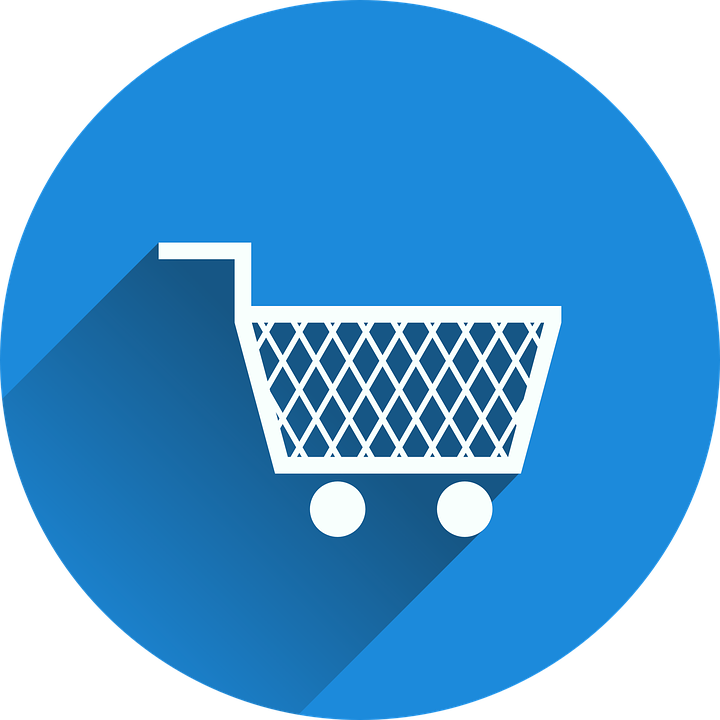 (And it would be a gift to GPS Hope as well, since 100% of the proceeds goes directly into helping us continue our full-time ministry.) 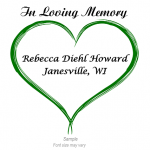 CLICK HERE to see the heart decals and find out more. Thank you my friend this helped me a lot. I will go back and read it over and over. Thank you for you and Dave. I am glad. So sorry you are having such a rough time right now, but I understand… love, hugs and prayers my sweet friend!